How it got to be March, I can’t fathom. It seems we just got through the holidays and now we’re “Springing Forward” (don’t forget to spring your clocks forward on Saturday night) and Women’s History Month is upon us. 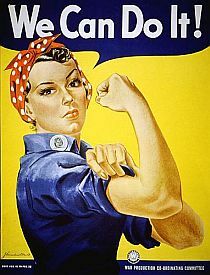 So in honor of Women’s History month, I thought a roundup of Rosie the Riveter history (or herstory) would be in order. Where Did Rosie the Riveter Come From? 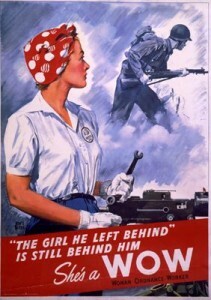 As most of you know Rosie the Riveter was an iconic (cartoon) figure who started out as a World War II era Norman Rockwell illustration for the cover of the Saturday Evening Post and became a propaganda poster to inspire women working at Westinghouse to support the war effort, filling jobs vacated by our young men who’d joined the military. Did you know that there was a Rosie the Riveter SONG? While it’s great fun to look over these historic images as part of Women’s (Welding) History month, I can’t help but contemplate how much has (not) changed. Sure, we still have amazing women in the metal fabrication and welding industry, but sadly they are still considered pioneers, outliers, when in truth women are just as well suited for this kind of work (some may argue better suited) than men. And yet, women still make up only a small percentage of working welders today. This is one reason I love featuring the New Rosies, to show other women that YES, We CAN Do it! Rosie the Riveter/ WWII Home Front National Historical Park is not only a PLACE you can go to in the San Francisco Bay area, they have lots of great information online as well. The Rosie the Riveter Trust, the nonprofit partner building a community of support for the new Rosie the Riveter/WWII Home Front National Historical Park. And if you are a New Rosie, let us know if you’d like to be featured! We’d love to share YOUR story! This entry was posted in Original Rosies on March 7, 2014 by Carmen.